Automation has never had so much potential to transform a business. It puts companies in the driver’s seat to lower costs, increases throughput and improves quality as market conditions continue to change. Today, customers do less annual forecasting, they reduce inventory in favor of just-in-time (JIT) delivery, and they do not combine shipments. Customers want parts in small batches, the need for quick turnaround is urgent, and there is continued pressure to keep pricing low. New Dimensions knows that flexibility is the key to handling such requirements as it strives to lead the industry in efficiency. The company has found that it can meet these demands by moving toward a fully automated production environment. For the last decade, New Dimensions has led an aggressive plan to add this type of flexibility. 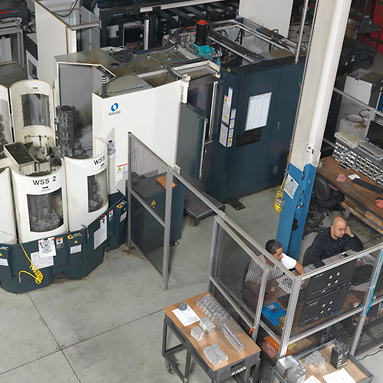 It started by replacing its vertical machining centers with high-performance horizontal machining centers. 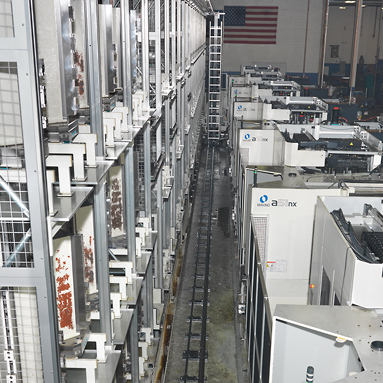 Then in 2007 the company began to automate, first purchasing four Makino a61 horizontal machining centers and an MMC2 automated pallet handling system that links the horizontal machining centers, cell control software and pallet loaders. 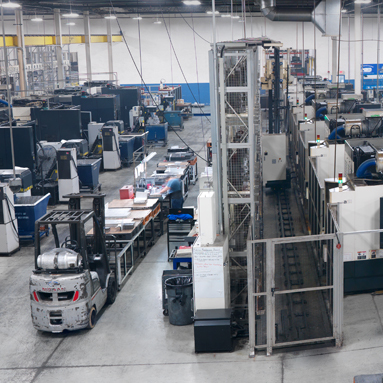 The success it saw with this flexible manufacturing system led the company to add two a61nx machines to that cell. 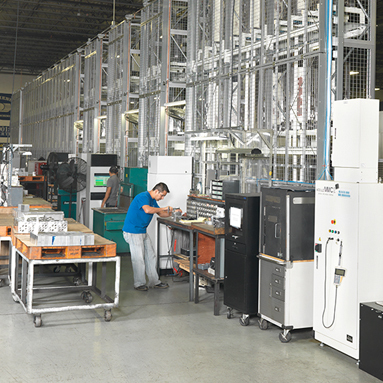 Today, the company has three flexible manufacturing systems on its shop floor. 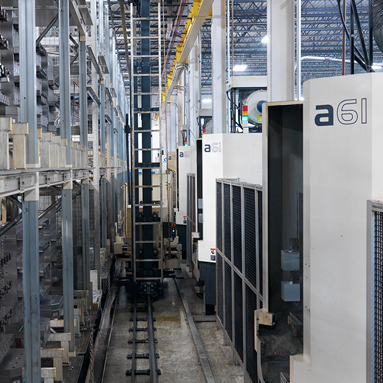 In addition to the first, another was created with four a51 horizontal machining centers and two a51nx machines. A third cell features six a51nx machines. All six machines, within each of the three automated pallet handling systems, are running parallel processes with five jobs in production at a time. These jobs are prioritized and coordinated by a Makino MAS-A5 cell controller, which puts New Dimensions directly in the driver’s seat. The Union, Illinois, company was founded in 1987. 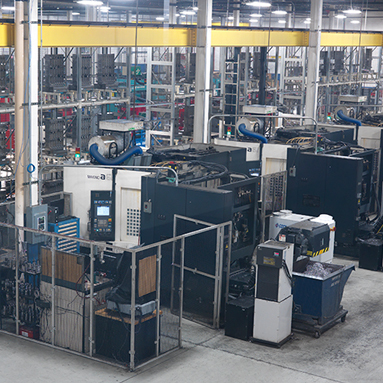 It specializes in the production of precision hydraulic manifolds and has gone from its early years as a small job shop to becoming a world-class organization. Despite the large growth over the years, New Dimensions remains very much a family business. Today, four of the owner’s sons work in the business alongside other family members and many employees with over 20 years at the company. While New Dimensions continues to excel in the fluid power market, its strong backbone of automated technologies gives it the capabilities to handle most any job—from small job-shop projects to larger production orders. These days, 70 percent of New Dimension’s parts are aluminum, and the rest are composed of iron and carbon steels. With the right tooling and training, New Dimensions has been able to produce up to 300 percent more parts per spindle than on its previous stand-along machines. According to Martin Halwix IV, who is the director of business development at New Dimensions, and Brian Halwix, the company’s philosophy since their father started the business has always been “If you are going to do something, do it right.” From the very beginning, New Dimensions has invested in high-performance machines to produce premium parts. The company’s road to flexibility has been an evolution from 3-axis vertical machines to automated cells, and by setting up three large, automated pallet handling systems, it has committed to a substantial investment in automation. He also pointed out that to be successful with automation, companies obtaining the new technology must be committed internally to working through any initial challenges related to the learning curve. New Dimensions personnel traveled to the Mason, Ohio, facility for training on macros and probes, since these had not been used with the company’s stand-alone equipment. Now with the right tooling and training, New Dimensions has been able to produce up to 300 percent more parts per spindle than on its previous stand-alone machines. Its new equipment has many options to customize the jobs, so New Dimensions can continue to dial additional parameters to further optimize efficiency. These flexible systems are a perfect complement to the company’s long-standing tradition of customer responsiveness. “When our customers are in a jam, they know we will not let their urgent job sit on the bottom of a queue of work. We will always move around production schedules to get those jobs on a machine as soon as possible, oftentimes the same day it is ordered,” said Marco Alejandre, general manager at New Dimensions. Adding to the flexibility afforded by the automated systems, each cell on the floor at New Dimensions has a 218-tool magazine, high-pressure coolant. The systems have over 100 pallet storage locations and five different workset stations. The automated pallet handling systems have given New Dimensions the vehicle it needs to keep up with the flow during high-mix, low-volume jobs. The company can handle the starting and stopping of city driving, and it has the efficiency to keep cruising through orders 24 hours a day, six days a week. Ever since day one, the goal at New Dimensions has been to efficiently complete the job for the customer, no matter what it takes. Many companies cannot be this flexible, especially if they have a long line of work in queue. For New Dimensions, it is all about process flow. Speeds and feeds are the focus if you have big lots to run, but for smaller runs, the focus is eliminating setups. In addition to the large- and small-run production work, New Dimensions also machines a lot of prototype parts. The prototype work may go through several revisions before moving into production and some may never make it into production. Not wanting to interrupt the workflow on these automated cells in order to perform prototype work, the company sought an alternative solution. While many companies perform this kind of prototype work on their stand-alone machines, New Dimensions has taken the concept two steps further, using a custom pallet pool system created with the help of Makino’s Engineering Services. Makino and New Dimensions customized the pallet pool with a MAS-A5 system, akin to those used within the company’s MMC2 systems. With the MAS-A5 software added, they then linked the prototype machine to the three MMC2 flexible manufacturing systems via the company’s internal network. The programming and tooling on the prototype machine are also tied into the MAS-A5 system so that this data can be sent directly into the flexible manufacturing systems, should a job go into production. 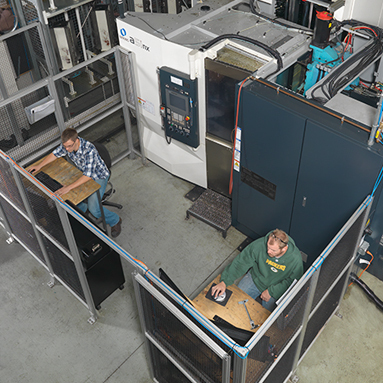 The prototype machine was designed to accommodate larger tool capacities and additional fixtures, enabling the company to pair this machine’s capabilities identically to the setups and processing methods conducted within the MMC2 cells. Each system uses detailed tool and fixture drawings for the jobs it produces. This information is shared between the prototype machine and the automated pallet handling systems via the MAS-A5. This approach keeps all processes standardized. This capability has enabled New Dimensions to transition prototype applications into full production orders quickly and easily. When these proven jobs are sent into production at one of the flexible manufacturing systems, all of the programs, fixtures and tooling data used in the prototype machine can be sent too, because they are identical to those found in the prototype pallet system. The cells and pallet pool were certainly the catalyst for change at New Dimensions, but what also enhances performance are the dedicated personnel assigned to each automated pallet handling system. There is an offline tooling manager and maintenance technician to keep things running smoothly for all three flexible manufacturing systems. 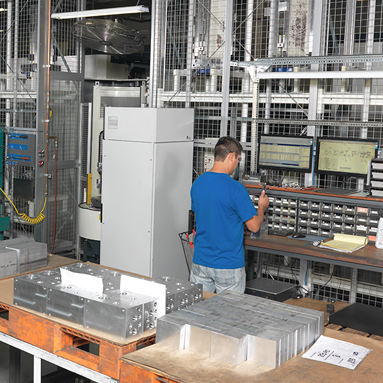 An automated tool management system is also in place in each cell, tied to the MAS-A5 cell controller, which directly links from the line to the tooling department. It is monitored 24/7 and can feed tool data into the cell and adjust the machine’s parameters or prompt a new tooling order. This system is notified before a tool expires so that an order can automatically be placed and the new tool sent. Another key to New Dimensions’ uptime is a preventive maintenance area that handles the grease, oil, lube and filter needs for the machines. The dedicated personnel, regular schedules and automated inventory systems are in place to make sure that all machines are being serviced proactively. Thanks to the company’s automated equipment, it has the capability to produce additional parts with the same number of employees. By transferring work to the Makino machines, New Dimensions was able to more than double production per employee and offer customers a reduction in cost. This saving helps the company deal with continued pricing pressures. Changes in the equipment technology also mean that the availability of technical positions at New Dimensions has increased. However, these are the very jobs that companies today are struggling to fill. To find a solution for this labor shortage, New Dimensions has been working with local high schools in order to encourage young people to enter the manufacturing field. New Dimensions tries to encourage new solutions by creating a company culture of creativity through forming problem-solving teams, especially after seeing many of its ideas come from machine operators. “I believe America’s manufacturing strength lies in creativity. It’s why our country is so innovative,” said Brian. The way New Dimensions has applied creative thinking in attracting new talent through the high schools has also paid off. In 2012, the company brought along 200 students to the International Manufacturing Technology Show (IMTS) to showcase the manufacturing industry. The success of New Dimensions’ mentoring programs has enabled it to hire several of these students. As New Dimensions builds its team and builds efficiency, what matters most is fostering a culture with new opportunities that keeps its employees engaged, all while growing the company. “People today want to be part of something that is bigger than themselves,” said Brian. “They want something that they can be proud of. When a team loses vision, its morale drops, growth stops and there’s the tendency to lose good people. Having high-tech equipment in place shows our people that we are committed to and are focused on the longevity of this company. Since investing in automation, New Dimensions is now able to run 50 pieces quickly while charging per-piece prices comparable to those when running 500 to 1,000 pieces. Automated tool management systems are tied to the cells’ MAS-A5 control system, monitoring and feeding tool data to adjust machine parameters or prompt new tooling order. By transferring work to the Makino machines, New Dimensions has been able to more than double production per employee and offer customers a reduction in cost. 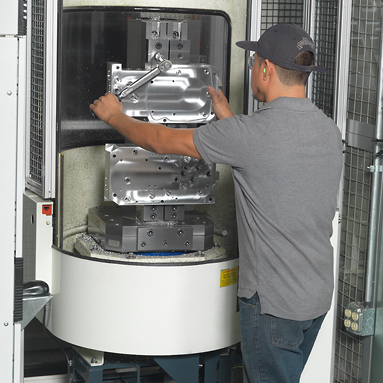 The Makino flexible manufacturing systems have helped New Dimensions produce up to 300 percent more parts per spindle compared to previous stand-alone machines. Across all three Makino flexible manufacturing systems, New Dimensions has access to more than 100 pallet storage locations and five different workset stations. The prototype pallet system features identical tooling, fixtures and control software to the MMC2 cells, allowing program and tool data to be quickly and easily transferred for production. Since its first automation investment in 2007, New Dimensions has invested in three Makino MMC2 linear pallet systems featuring six machines on each cell.